Saturn is well known for its rings, and remains the single most impressive sight an astronomer can show off through his telescope eyepiece, but astronomers have discovered that it has many other fascinating aspects. Most surprising of all was the discovery of a perfect giant hexagon encircling it’s North Pole. 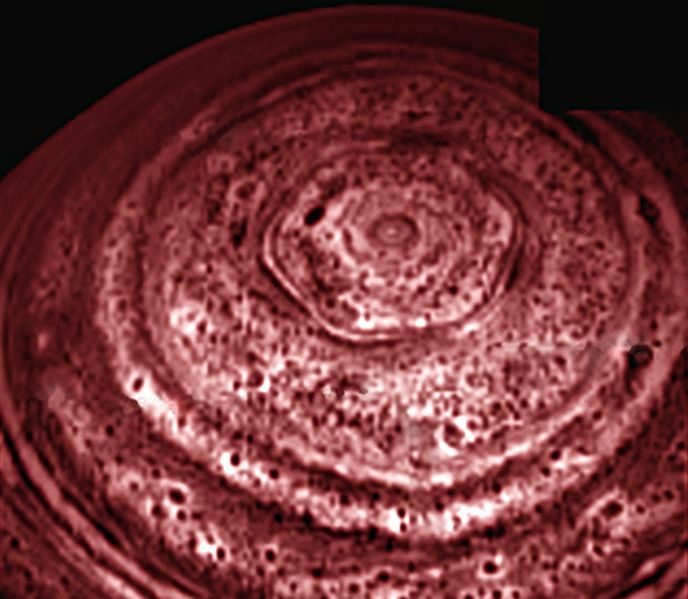 Like all the Gas Giants, Saturn has a number of horizontal ‘belts’ marking out the various atmospheric jet-streams, but the most north belt is permanently distorted into a hexagon, and nobody has been able to explain why. New work at the University of Oxford may shed some clue, however. Physicists Ana Claudia Barbosa Aguiar and Peter Read built a circular tank with a smaller disk near the middle. The small disk was made to spin, to drag the water in the tank around and simulate a jetstream. The entire tank rotates as well, and by setting the speeds of the tank and the jetstream correctly, they found that resonances were set up which bent the jetstream into various geometric shapes. They could even choose which shape to form by varying the relative speeds of the water and the jetstream. For more information, and a Video clip of the experiment in action, read this article from Science magazine.